It is Christmas time which means it is time to show good will toward your fellow man. Now, we know that is not going to happen here. The holidays for the Carringtons and the Colbys is a time of conflict and drama. And, we would not want to have it any other way. In a pointless reminder of where we were before, Jeff agrees to help Nicole find the treasure only because he believes it may lead to Fallon. Jeff, if you think that the model may have been in the plane with Peter, why not try to track down the model also. It is not like she could go missing without anyone else noticing - even if she is not American. Does this mean we will see Tony without his shirt again? Steven notices something is bothering Claudia and wants her to open up to him. Claudia should have taken a page from Steven's playbook and kept her mouth shut. No, Claudia admits to having a one-night stand with Dean Caldwell. She asks Steven to forgive her and claims, as she always does, that she was lonely. What the hell is Steven supposed to do? He is pissed. Steven does take it a little further later when he claims Danny as his son, and his son alone. Claudia, keep your mouth shut! That does not sit well with Claudia. When Steven apologizes for the remark, Claudia is not in a forgiving mood. She does not need Steven's Christmas-time apology. 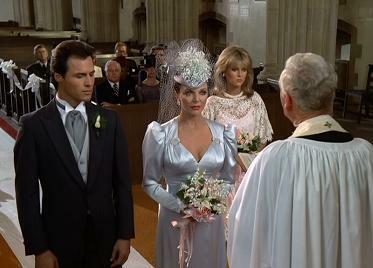 Even better, Claudia decides to team up with Adam to find out what the issue with Dominique is. This seems like some unholy alliance. Okay, that is going a little too far, but this cannot lead to anything good. At least Krystle and Blake are becoming close again. And, why not? Kristina is doing well and they got to watch Allegree win another race. Oh, if only they had not sold the horse. Good news, the horse is up for auction by its owner Daniel Reece, head of Delta Rho Stables, Inc. Daniel spots Blake and Krystle in the hospital and instantly recognizes Krystle even though she did not see him. Oh no, it can't be! Blake and Krystle attend the auction but Daniel pulls Allegree. Instead, Daniel will just offer the horse to Blake. Blake is suspicious of Daniel's kindness but buys the horse for Krystle anyway. Krystle is excited to have Alllegree back. Daniel seems excited to know that Krystle is around because he changes his plans to remain in Colorado. Daniel sends Krystle a Christmas present - a horribly photoshopped picture of a young Rock Hudson and Linda Evans sitting together. An intern needs to be fired for this. Anyway, Krystle remembers Daniel Reece as someone who used to date her sister, Iris. Blake is more concerned about the value of the frame which is in the thousands. Clearly, Krystle cannot keep the gift. Clearly, Blake must remember not to tell Krystle how to live her life. She would have returned the frame anyway. Krystle, of course, returns it herself and chastises Daniel for coming back into her life after what he did. Blake invites Dominique to spend the holidays at the mansion. Dominique is grateful for the invitation but wants more - she wants Blake to acknowledge that she is Tom Carrington's daughter. Blake is not willing to do that. 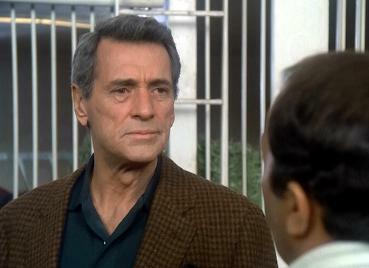 Besides, Blake tracked down his father (he is still alive?) and Tom denied it. Of course Tom did. Alexis, Dex and Amanda make it to London. Amanda has feelings for Dex and thinks Dex should not marry her mother, but Dex does go through with the wedding. Meanwhile, Blake tracks down Amanda and tells her he would like for her to return to Denver once the wedding is over so they can perform the blood test. Amanda, unfortunately, cannot go because Alexis took Amanda's passport while Dex and Alexis go on their honeymoon. Alexis should not have left Amanda alone in London because she manages to track down Rosalind and gets Rosalind to admit that Blake is her father. 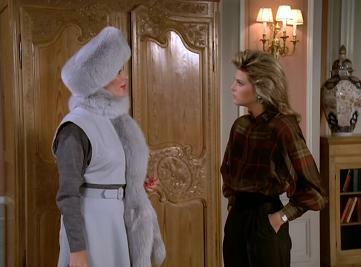 Amanda confronts Alexis with the news when they return. Well, there will be no Caribbean cruise for the three. They return to Denver where Amanda tells Blake the great news. Blake is so happy. That looks like Pamela Sue Martin! 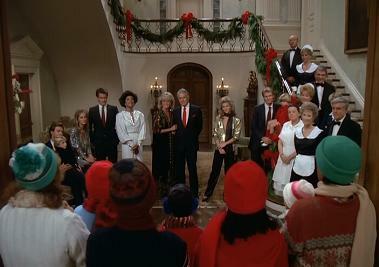 The family celebrates the holidays in the mansion. Someone must have rented some carolers to show up because it's not like they are going from door to door and made it to the mansion on their route. Santa arrives and the two kids open gifts. Krystle has a gift for Blake, a portrait of Fallon. Pay close attention to that portrait. Blake then calls the family for a toast to welcome a new member of the family - Amanda. That is really tasteless of Blake because Dominique was sitting right there. Dominique, rightly, gets up and leaves. Now, Adam and Claudia are intrigued why Dominique would storm off like that. Alexis interrupts the family celebration and demands that Amanda return home with her. Alexis will not lose Amanda to Blake. Amanda would rather stay with Blake, but Blake wants to keep peace and Amanda does return to the home of Alexis and Dex. That should be a fun place for Christmas, New Years, etc. etc. Alexis [to Amanda]: So much for daddy, how about a Christmas kiss for your mother. Krystle [to Daniel]: How dare you come back in my life after what you did!